The “official” estimate for the day was 15,000 people. (I was told that by media, sheriff, and one of the Phoenix PD who was there). The Sheriff’s office said they had never seen an event like this: Zero incidents and people coming up to them all day thanking them for the support. 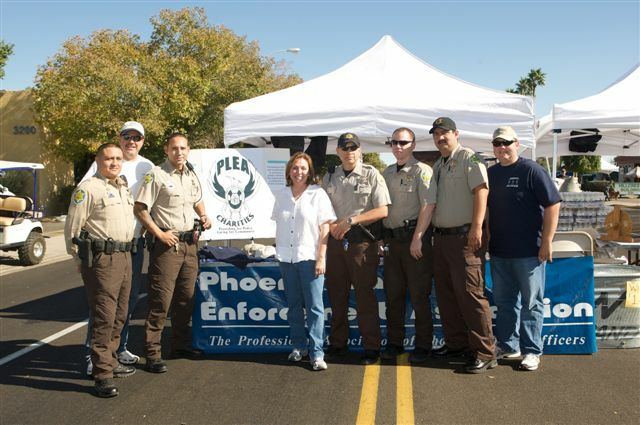 In addition, we couldn’t have pulled this off without the support of PLEA. Their police volunteers (something many laughed and told me was an oxymoron) were by my side every step of the way. They were there to serve anyone and everyone from set-up to break down. Again, I ask that my group can build on this relationship that we enjoy with PLEA and be a bridge to making peace where peace is needed. Michael [Johnson], your phone calls from wherever you were last week (Washington?) meant the world to me. And it was great to see Adora and her kids as I flew by on my chauffer driven golf cart. Greg [Stanton], it meant a lot that you could come out and meet some of the folks and thanked MCSO publicly. It was the right thing to do. I do appreciate you both and hope the three of us can continue to work together for the good of all. By everyone’s account it was a very successful event. But I will measure the success of this event by two things: How much money we raise for the charities; and how hard we work together to build on this success: Businesses, homeowners, city officials, county officials, Union and 4th Floor – real partners, building real prosperity for the good of all.